By Jim Tharpe on Monday, December 23rd, 2013 at 10:31 a.m. 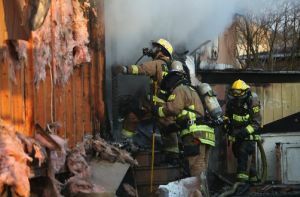 Some newsmakers could had used the help of firefighters to douse some of their more explosive claims. Photo credit: Reuters. Today’s roundup kicks off a weeklong review of some of the best of PolitiFact Georgia from 2013. To comment on our rulings or suggest one of your own, go to our Facebook page (www.facebook.com/politifact.georgia). Full versions of the fact checks can be found at www.politifact.com/georgia/. You can also find us on Twitter (http://twitter.com/politifactga). Coalition to Stop Gun Violence: Says U.S. Rep. John Barrow, D-Ga., celebrates gun ownership even in the face of school shootings. The war over gun control heated up this year. Attacks from both sides have been almost continuous since a deranged gunman killed 26 people -- mostly children -- at an elementary school in Newtown, Conn. The furor intensified targeting of gun violence. The Coalition to Stop Gun Violence got into the fray by attacking a Georgia Democratic congressman on his ties to the National Rifle Association and his opposition to President Barack Obama’s gun legislation. The coalition uses Barrow’s own 2012 campaign commercial in an attack on him and the NRA. The Washington-based coalition of 48 religious organizations, lobbyist groups and other associations refers to itself as seeking "to secure freedom from gun violence through research, strategic engagement and effective policy advocacy." PolitiFact found the anti-gun group took Barrow’s campaign ad and doctored the video by splicing in scenes and sounds from the Newtown mass shooting and adding a "shame on you" tag line. Even more egregious, the coalition chose to selectively edit Barrow’s original statements, leaving out key elements that helped explain the congressman’s stance on gun rights. By leaving those parts out, the coalition changes Barrow’s central message supporting gun ownership for protection and self-defense. The group attempted to target Barrow with a highly emotional ad. But it comes across as the Gang That Couldn’t Shoot Straight. Our rating: Pants On Fire. U.S. Rep. Paul Broun: "There are more people killed with baseball bats and hammers than are killed with guns." Some gun control critics are using a similar talking point in the national debate over this issue. PolitiFact Georgia spotted two recent claims on the topic that show the importance of being precise when making an argument on an issue. One speaker got it right. The other person made a more general statement on guns and got it wrong. Our odyssey began when an interesting comment by a state senator started making the rounds at the Georgia Capitol and on Twitter. "There's more murders with hammers last year than … shotguns and pistols and AK-47s," said state Sen. Bill Jackson, a Republican from Appling. Two days after Jackson’s statement, Broun, a Republican congressman from Athens, was quoted by Slate.com on the same topic. "There are more people killed with baseball bats and hammers than are killed with guns," said Broun, who believes in limited government and is running for the U.S. Senate in 2014. Broun’s general use of "guns" by its nature includes handguns. That makes his statement way off. FBI statistics show that 8,583 people were killed with all guns in 2011 -- most of them (6,220) with handguns. Broun is a congressman who has inserted himself directly into the heated gun debate. His high-profile run for the Senate means that more of his statements will end up in the glare of the spotlight. Lauren Benedict of Georgia’s WIN list: U.S. Rep. Phil Gingrey wants public schools to teach women to "stay in their place." Gingrey, a Marietta Republican, affirmed his support for traditional marriage during a speech before the U.S. House of Representatives, and he suggested some value-teaching methods for young people and outraged some of his critics all at the same time. Georgia’s WIN List, a political action committee that helps recruit and train Democratic women for political office, sent out an email the day after Gingrey’s comments. The message was sent as part of a fundraising plea and signed by the PAC’s chairwoman, Lauren Benedict. "Rep. Phil Gingrey is promoting the teaching of gender stereotypes in elementary schools. He wants public schools to teach women to ‘stay in their place,’ " the email said. The group said that the phrase "to stay in their place" was for emphasis and not a direct quote from Gingrey. Video of the congressman’s comments show that he did not use this phrase. Gingrey did make statements about gender roles that some critics found offensive. But Benedict quotes Gingrey as mouthing specific words that he did not utter. Chain email: A "hidden" provision in the health care law taxes sporting goods as medical devices. Gwinnett County resident Don Smith asked PolitiFact Georgia to check out an email he got that he found suspicious. The email contained a photo of a receipt from Cabela’s, a Nebraska-based retail store that sells sporting goods, guns and camping gear. Cabela’s is not in Georgia. Underlined in yellow on the receipt is the amount charged for a "medical excise tax." "The 2.3 (percent) Medical Excise Tax that began on January 1st is supposed to be ‘hidden’ from the consumer, but it’s been brought to the public’s attention by hunting and fishing store Cabela’s who have refused to hide it and are showing it as a separate line item tax on their receipts," the email says. The email says it went on the Internal Revenue Service’s website and did some research. "And what do I find under ‘MEDICAL DEVICES’ under ‘MANUFACTURERS TAXES?,’ The following discussion of manufacturers taxes applies to the tax on: Sport fishing equipment; Fishing rods and fishing poles; Electric outboard motors; Fishing tackle boxes; Bows, quivers, broadheads and points; Arrow shafts; Coal; Taxable tires; Gas guzzler automobiles; and Vaccines." PolitiFact found the email is way off base. It implies that items that can be taxed include fishing rods and some cars. The email also says Cabela’s sporting goods store "refused to hide" the tax. Wrong. The company said it made a mistake when it taxed customers and would refund them. Our rating: Pants On Fire!